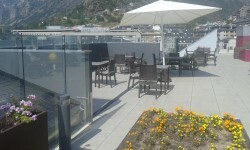 The DomusVi Salita Nursing Home for Elderly People is in the Parroquia de Escaldes-Engordany in the Principality of Andorra, very close to the green zones of Prat Gran. This new building is completely accessible, is spacious inside and has a garden-terrace. It is equipped to offer the greatest comfort. The nursing home has been designed with large light spaces, and is divided into different residential units to guarantee personalised care, where people can live according to their needs. Each unit has its own dining room and living room. DomusVi Salita is in a quiet part of Parroquia de Escaldes-Engordany, opposite the Caldea building. It is on the city bus route, which is just 60 metres from the Center. Comfort, character and a family atmosphere. Parking spaces are available for clients. We can help you. Click here to request more information or if you want wel call you. Find out what we think of our residents and their families.